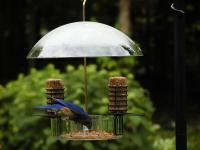 I really love this bird feeder! I had one of them for 15 years, but it finally broke and I was so worried they would not still have it in stock. I purchased two this time and hang them side by side. It definitely is not squirrel proof as they climb up the shepherd's hook I have them hanging from and then hang on for dear life to the dome and either eat upside down or swing into the bowl and settle there. It amuses my cat to no end (and me, too). The birds love it just as much. My papa cardinals feed their little babies by flying back and forth from the feeder to the hedge until the babies are old enough to "settle" into the base and eat on their own. The blue jays also like it, even though they are bigger and have to be careful when they fly in. I noticed it now comes in a light blue color, too, but I like the clear ones the best. Thanks for a great feeder at a reasonable price! 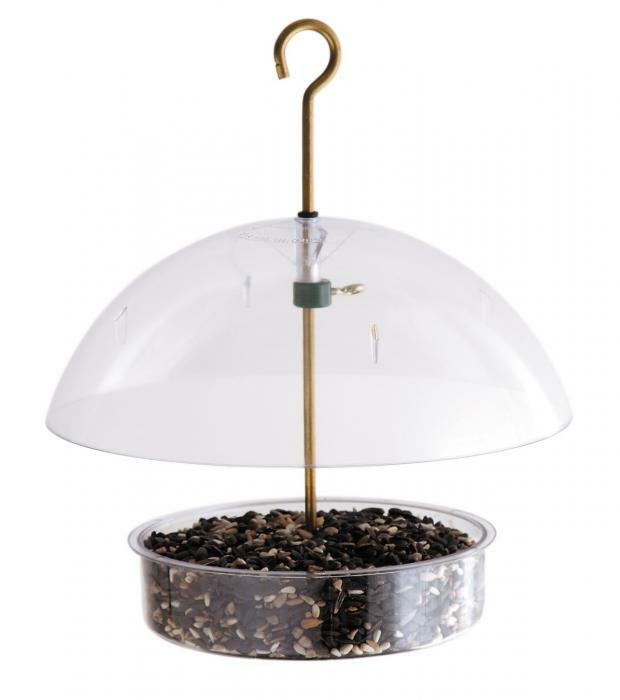 We had one of these before and after trying several other kinds ordered this one again because it holds enough seed and doesn't allow the bigger birds access. Also it protects the seed from rain. We recommend it highly. 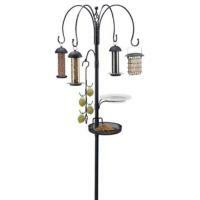 The cardinals in our backyard love this feeder, and we do too. You can adjust the upper shield to shut out larger birds (e.g., starlings) so the smaller birds can feed. It's easy to clean and squirrels have stayed out (but if you have a problem, a little Vaseline on the dome will keep squirrels from getting a foothold). The song birds seem to enjoy the feeder. I did a double take to see squirrel go up the shepherds hook and then down and get into the narrow space of feed tray under the dome. Have adjusted that spacing. Needs to be able to move the top higher when refilling with seeds. This feeder works well in the winter to keep snow off the seeds. I adjusted the height so only small birds like finches and wrens can use it. I plan to use it as a bluebird feeder in the spring and put meal worms in the tray. One caution is to be sure the metal rod in the center is tightly screwed after any cleaning and filling. It can be completely taken apart for cleaning.